“These three factors are related. By affinity we mean emotional response. We mean the feeling of affection or lack of it, of emotion or misemotion connected with life. (Misemotion would be an unpleasant emotion such as anger, fear, grief, apathy, etc.) By reality we mean the solid objects, the real things of life. By communication we mean an interchange of ideas between two people. 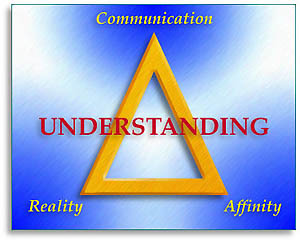 Without affinity there is no reality or communication. Without reality there is no affinity or communication. Without communication, there is neither affinity nor reality. Now, these are sweeping statements but are nevertheless very valuable and are true. This triangle can be used in countless ways to improve your marriage. Let’s take a look at a couple of examples. You and your spouse have not been feeling very affectionate towards each other lately. You could attribute this to any number of reasons or you could just go to work on increasing the affection between the two of you. Per the material quoted above, if you improve one corner of this ARC triangle, you improve the other two. The affinity part of the triangle has been weak of late, so how should we handle this? One suggestion is to improve reality. For the next while, talk often about things that are very real to your spouse. Bring up subjects that your spouse has a good deal of reality and agreement with. Place objects (such as food, magazines, clothes, etc.) in front of your spouse that he/she has a good reality on. If you communicate as much as possible on areas that are very real to your spouse and present objects to your spouse that are also very real, you will see something very interesting occur. The communication AND affinity will go up. And it will be the kind of affinity that you want to increase. What if the communication has been lacking with your spouse? You and your spouse haven’t really been talking to each other over the past few days or weeks and you definitely feel the adverse effects of that. It may even be affecting other areas of your life. How could we apply the technology of this ARC triangle to this situation? Well, we have two corners remaining: affinity and reality. Which one should you choose to work on to bring the communication back up? You could actually choose both! Once again, bring up subjects that are very, very real to your spouse and the communication level will come up. Or you could approach this problem by direct use of affinity. Even if you do not feel very affectionate, show some affection towards your spouse. Maybe some flowers from the husband. Perhaps a great back rub from the wife. Or vice versa: flowers for the husband and a back rub for the wife! Whatever you decide to do, you’re just trying to show some affection. Yes, if you’re out of communication with your spouse, it’s not very likely you’ll be feeling very affectionate. But you have shown affection for your spouse many, many times in the past. You know how to … so, put some affection on the line, do it a few times and you will enjoy the resultant increase in communication. Which will bring the affinity back up to where you’d like it to be. The ARC triangle has tremendous potential to help your marriage. Take this potential and make it a reality! Copyright © 2001 Workable Solutions. All Rights Reserved. Quoted material by L. Ron Hubbard: © 1965 L. Ron Hubbard Library. Grateful acknowledgment is made to L. Ron Hubbard Library for permission to reproduce selections from the copyrighted works of L. Ron Hubbard. This article was written by Stan Dubin. Additional information can be found at the blog: Marriage Success and in the book: When the Thrill Is Gone. You may republish this article in your newsletter or at your web site or blog providing the entire article is kept intact, including the copyright and contact links.